HOW ANJALI DESIGNED THE WORLD FAMOUS BRACELET - "TAO"
At Angel Jewels, Each masterpiece is crafted to individual needs and taste and produced in various stages of manufacture, as follows. 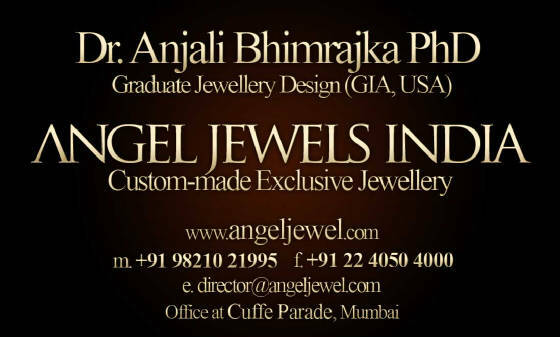 Anjali Bhimrajka is a graduate jewellery designer from GIA. She is into custom made exclusive designing for celebrity clients in Asia. The following description details the making of one of her famous custom designed bracelets – a complete out of the box idea defying all traditional norms and ideologies held sacred for many decades. The Client was a well decorated retired Colonel, who served with the special forces. He wanted a design which was unconventional, different and which portrayed his devotion the country’s forces. Selecting a metal composition which would tand the rigors of rough handling at the same time be malleable to work with, Anjali opted for a 18K champagne gold for the main body of the bracelet. Anjali started with the shape & configuration first, selecting a broader than usual width of 1.5 inches and thickness of 5mm. The design template was both rigid and flexible, with broad thick links linked together to give a supple band which would roll easily on the wrist of the client. The LINKS were 8 with seven square links of size---------& one rectangular centrepiece of larger size---------. Each link was curved convex outward to enhance the presence of the motifs that it would contain. The HINGES were then selected as RIBBED on top & flat on the bottom, to give the appearance of strength and power, in bonding the links. The MOTIFS were selected next. In keeping with the Special Forces logos, Anjali opted out for the symbols of the Paratrooper Wings, The charging Bison, Lightning, Cat & Dagger. Anjali suggested adding the Japanese calligraphy of Bushido – Samurai Code of honour, which was gladly accepted. 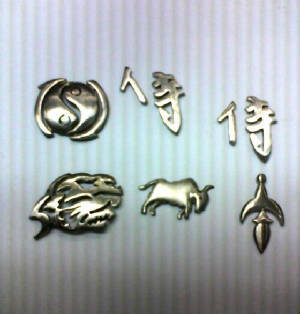 The Centre piece options given were the National flag or the Chinese Ying Yang symbol of the Tao. The MOTIFS were manufactured next with rigid 18K (white gold) composition, only after perfecting it with trial and error templates of copper. They were then moulded into convex shapes. Then they were carefully soldered upon the links, avoiding spillage or flattening. TRI COLOR STONES were then added to the centre piece to display the colors of the National Flag. The stones – emeralds, amethysts & white sapphires were carefully selected from various locations across the world. Finally the decision had to be made on POLISHING. 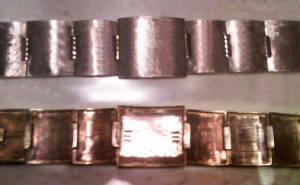 Initially Anjali experimented with traditional white gold but the bracelet looked too traditional. Next a Dual color combination of white & yellow gold was tried, which looked too western, as Anjali wanted a eastern look. Finally a radical decision was taken. The unpolished bracelet looked champagne gold in tone, which by itself had a unique sheen & personality by itself. It was decided after many opinions that the bracelet would be left unpolished, raw & glistening, in its element to outshine the other traditional tones. Finally on trial on the owners wrist, the Bracelet would rotate under gravity to assume a position where the center piece would fall on the underside of the wrist and become hidden to viewers eye. Then subtle balancing had to be done by addding plates of white gold to underside of the links. this was not easy, as the links were odd in number, 3 on one side & 4 on the other side. Finally the bracelet was balanced. anjali decided to call it TAO - or balance in the order of things. This would epitomize the balance in the bracelets tone, color, weight, composition & character.